Most people love their cars a lot. Because of that, they usually find it very difficult to come to terms with dents on their cars because dents are usually expensive to fix. 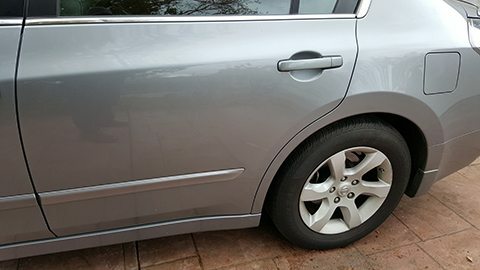 Shallow dents, on the other hand, are not such a huge deal given that the damage is usually just aesthetic. For this article, we’ll assume that the impact that made the dent is soft enough that the paint wasn't removed, exposing the bare steel. 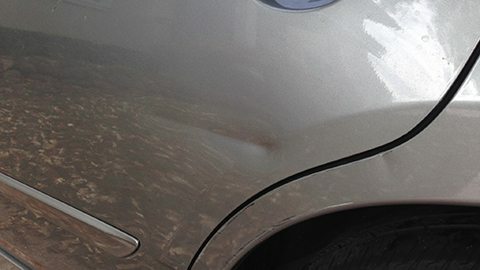 Paintless dent repair (PDR) is a technique used to repair a car's body to its original condition quickly and in an environmentally friendly way. What's more, this sort of repair is cost effective and can remove dents from body creases, dents from other vehicles, and even hail damage. Although a somewhat straightforward process, you should only let a skilled person perform this repair for you. For the trained hand, the repair won’t take as much time, and the results will speak for themselves. Unlike other dent repair services, we aim to repair the car without incurring the owner extra costs. This means that since our technique doesn’t involve a lot of cutting and paint jobs, the repair costs are much lower than conventional dent repairs. Dealing with the insurance company, especially when it comes to payouts, can be hectic. By using PDR, you save not only money but time. In an auto body shop, dent repairs are done using body filler or paint which is then matched to the exterior of the vehicle. Although it is effective, it tends to be more expensive and impacts your resale value. PDR eliminates the dent in a way that no one is the wiser. » PDR earns you savings not dealing with Rental car companies. When your car is in the shop, most people have to rent a car to move around. The PDR way takes just a little time to complete the task. Hence, you won’t have to rent out a car. Unlike traditional auto body shops where you bring in your car, we can come to you for the repairs. This means no waiting in line. The car is fixed fast and efficiently. Our technique is foolproof. We have tried and tested it on hundreds of cars, and once we have eliminated the dent, it's gone for good. Experience is critical when repairing anything especially cars. An experienced Paintless Dent Removal Technician knows what to do when it comes to the various types of dents and what the best way to handle them is. A newbie will use trial and error to solve the issue which might lead to further damage. If you aren’t an expert, performing DIY PDR is not a good idea. The machines used should only be used by someone who knows what they are doing to avoid extra damage or injury to the car or oneself. Without the proper experience, removing the dents is a tough job. A dent removal pro knows what to do in almost every type of scenario. Their experience here works for you to return the car to its former glory. How much does it cost for Paintless Dent Repair in Orinda? Given that the paintwork hasn’t been damaged, the repair should be quick and inexpensive. Depending on the shop’s reputation, you should expect to part with $50 to $120 for a 1-inch dent and about $10-30 for an additional half inch. Given that they don’t have to re-paint the car once the dent is removed, it saves a lot of chemicals and paints fumes from entering the atmosphere. This helps to keep the air clean and pure. We boast of twenty years of experience in the business. Hence, our paintless dent repair in Orinda CA 94563 services are unmatched. We use our wealth of experience to give you the best service possible. Once we take on a client, we ensure that they are fully satisfied with our work. We are highly organized in that all communication goes through one single point. This helps to keep the message clear and concise throughout the repair. We pride ourselves in being one of the most fairly priced repair shops in the Orinda area. We operate with full transparency and no hidden charges.